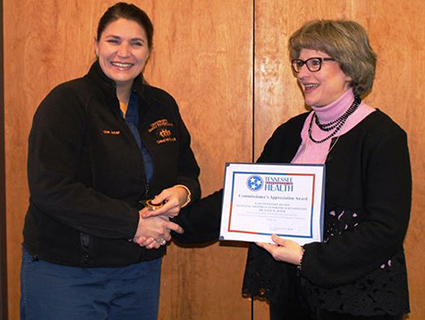 Julie Jeter, MD, Assistant Professor, Family Medicine, was presented with the Commissioner's Commendation Award and Outstanding Service Award Medallion by East Tennessee Regional Medical Director Tara Sturdivant, MD. This award is from Dr. John Dreyzehner, Commissioner of Health for the Tennessee Department of Health, and is presented for outstanding service in connection with the East Tennessee Region Neonatal Abstinence Syndrome (NAS) Pregnant Postpartum Intervention to reduce the increasing incidence of NAS births in East Tennessee. Dr. Jeter played a vital role in voluntary long-acting reversible contraceptives (VRLAC) clinics by providing her clinical skills as well as dedicating the assistance of Family Medicine resident physicians. This provided educational opportunities for the residents and knowledge and skills for the VRLAC clinics and patients. 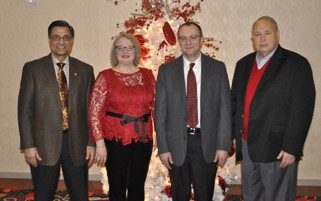 Several distinguished faculty members received awards at the Department of Medicine’s Annual Faculty Recognition Dinner. Timothy Panella, MD, received the Beasley Pylon Award in recognition of his outstanding leadership during his service as chair of the Department of Medicine. The RA Obenour, MD, Distinguished Alumnus Award was presented to William B. Smith, MD, for his outstanding career in his fields of cardiology, nephrology, critical care medicine, and internal medicine, as well as serving as the president of the New Orleans Center for Clinical Research (NOCCR) and Volunteer Research Group (VRG). The London Award for a faculty member who shares a dedication to excellence was presented to James Shamiyeh, MD. The recipient of this award is chosen by our internal medicine residents. The RA Obenour, Jr., Award for steadfast dedication to excellence in teaching was presented to Tina Dudney, MD. 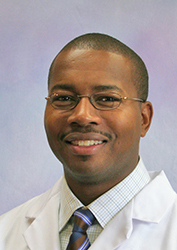 The American Journal of Roentgenology (AJR) has selected Yong Bradley, MD, as a top manuscript reviewer. AJR has more than 1,900 national and international volunteer manuscript reviewers and top reviewers, like Dr. Bradley, are listed on the masthead of the monthly journal throughout the year. "This honor speaks to Dr. Bradley’s commitment to evidence-based radiology and to his scholarly commitment as the AJR is one of the most trusted radiology publications," said Dr. Laura Findeiss, chair of Radiology. 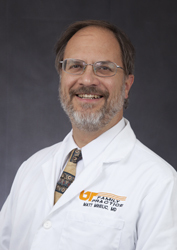 Dr. Bradley is Chief of Nuclear Medicine at The University of Tennessee Medical Center and Associate Professor of Radiology for the UT Graduate School of Medicine. He specializes in nuclear medicine and his work has been published 26 times in more than a half-dozen journals. The AJR is a monthly peer-reviewed journal with a worldwide circulation of approximately 25,000. According to AJR, consistent, high-quality reviews are essential to the success of the journal. Richard Obenour, MD, Vice Chair of the Department of Medicine (DOM), has retired from the UT Graduate School of Medicine, finishing a career that started just after Watson and Crick unraveled the DNA double helix and followed the still accelerating trajectory of the information explosion in the medical sciences. After receiving his medical degree from the University of Tennessee, he completed an internship at the historic Knoxville General Hospital during its last year of existence. He started his residency in 1956 when the doors opened at the newly constructed University of Tennessee Memorial Research Center and Hospital (UTMRCH). He admitted the very first medical patient to the new facility, a man transferred from the old hospital in a hearse. Dr. Obenour’s training was interrupted when he was drafted into the Navy. After two years, he returned to Knoxville to finish his resident year before moving to Duke University to complete his internal medicine training and start a cardiovascular research fellowship. When the equipment needed to start his research project did not materialize, he accepted an opportunity to study the effects of altered surfactant on the mechanics of breathing. His career in pulmonary medicine was born. In 1962, he came home to practice as the only nonsurgical lung specialist in this region. After six years of solo practice, he brought in his first associate, and over time, the practice grew into the Knoxville Pulmonary Group, precursor to University Pulmonary and Critical Care. In 1973, he became the first pulmonary division chief at the medical center, a post he held until 2004. In 1992, Dr. Al Beasley, then Chair of the DOM, asked him to be his Vice Chief. One of his several accomplishments in that role included the establishment of the Quality Assurance Program. Dr. Obenour recognized early the need for interdepartmental communication and incorporated other departments into the process to study outcomes that are now benchmarks of treatment for pneumonia and other illnesses. He also developed a physician credentialing system that with some modifications is in general usage today. In the course of his career, he has served on more than 66 committees and chaired 9 of them. He has served as interim chair of the DOM twice. His career has been a journey of discovery and change. He saw the transition from the x-ray hanging on a view box to the CT scan delivered to his office computer, from treatments aimed at relieving symptoms to disease modifying drugs chosen to target a specific genetic mutation. He has seen a clipboard of vital signs evolve into the electronic medical record. "Pat Summitt Foundation and The University of Tennessee Medical Center Form Partnership to Create the Pat Summitt Alzheimer's Clinic"
"Pat Summitt Foundation, UT Medical Center to partner on clinic"
"New revolutionary hip replacement surgery"
"Sharing a life: UT Medical Center celebrates organ transplants"
"Miss Delaware announces new pageant leadership"
"Heart disease survivor: Education is crucial"
"Lawmakers learn more about 'Right to Try' legislation"
"Spring forward! Tips to cope with losing that hour of sleep tonight"
"UT surgeon urges hospitals to use non-addictive pain meds"
Keith Gray, MD, Chief and Associate Professor, Surgery's Division of Surgical Oncology, graduated from the Physician Executive Masters of Business Administration (MBA) program at the University of Tennessee. During this speech at the graduation ceremony, Dr. Gray acknowledged all who have helped him during his academic career and said, "Many have asked me, 'What next?' I am going back to work on Monday and do what I do, healing through serving those under my influence. I serve because I love my patients, I love my profession and I love my classmates." 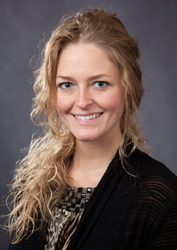 Emily Martin recently earned her PhD degree in Comparative and Experimental Science and has joined the Department of Medicine as an Assistant Professor. For her doctorate degree, Dr. Martin studied "Characterization and development of amyloid-reactive peptides as tracers for quantitative molecular imaging" under the direction of Jonathan Wall, PhD, Director of the Preclinical and Diagnostic Molecular Imaging Laboratory. She said her work, funded in part by PMERF, focused on the interactions of several heparin-binding peptides with various amyloid materials. Characterization of the peptides involved assessing their reactivity with different types of amyloid and determining which had the strongest interactions. Molecular imaging studies, using preclinical PET/SPECT/CT imaging modalities, in amyloid-laden mice were conducted to observe the efficacy of the peptides as amyloid imaging agents. To potentially enhance the amyloid-reactivity, peptides with different properties were designed and tested. The findings indicated that molecular imaging with peptides that have optimized properties may be of clinical merit in the detection of amyloid and/or the ability to monitor response to therapy in patients with amyloidosis. Dr. Martin said, "The disease is extremely complex, and early detection is the key to a better prognosis. We believe these peptides may hold the answer to an unmet clinical need." In addition to Dr. Wall, on Dr. Martin's doctoral committee were Stephen Kennel, PhD, PDMI, and from the UT School of Veterinary Medicine were Stephen Kania, PhD, and Robert Donnell, DVM, PhD, DACVP. Contributors to her research were Angie Williams, Tina Richey, Penney McWilliams-Koeppen, Sallie Macy, Melissa Weaver, Craig Wooliver, Steve Foster, Alan Stuckey, Dustin Osborne, PhD, Brianna Rader, Angela Lee and Jim Wesley. 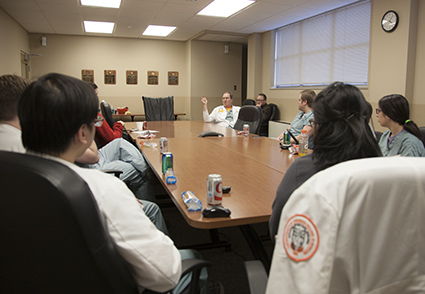 For the first time, the UT Graduate School of Medicine offered Residency Exploration Days seminars and the Capstone Course to UT Health Science Center medical students. Residency Explorations Days gave residency program directors and residents from each UT Graduate School of Medicine program the opportunity to meet with medical students, introduce each of the programs, and discuss life as a resident and practicing physician within each specialty. 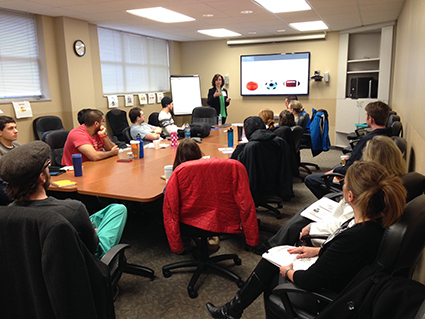 Although a similar presentation is available to medical students at the UT Health Science Center College of Medicine in Memphis, this was the first time "Residency Exploration Days" was available on the Knoxville COM campus. Medical residencies available at the UT Graduate School of Medicine are Anesthesiology, Family Medicine, Internal Medicine, Obstetrics and Gynecology, Pathology, Radiology, Surgery, Transitional Year, and Urology. Medical students said the meetings were helpful for learning more about the available residency programs. Allan Hamilton said, "I have rotated through a lot of the programs as an M3, so I knew a lot about Family Medicine, Internal Medicine, Surgery, and OB. I am interested in Pathology, though, so I did enjoy having a Pathology resident coming and talking about the program - a typical day, different opportunities, etc." Medical students also got to participate in UTGSM's first Capstone Course. This class is designed to provide simulations of some of the major factors that residents are likely to encounter when they begin residency and ensure residents reap the rewards of a career in medicine. The Neuroscience Network of East Tennessee (NeuroNET) has awarded a seed grant to an interdisciplinary research group that includes faculty members of the UT Graduate School of Medicine, the UT Department of Electrical Engineering and Computer Science, and the UT/ORNL Bredesen Center for Interdisciplinary Research. This research group has formed to study quantum mechanical effects in biological systems, and specifically to explore non-local phenomena in neuronal cell cultures. Such research involves coordination of the capabilities of multiple subject matter experts. Cell culture expertise is being provided by cellular biologist Deidra Mountain, PhD, Department of Surgery’s Vascular Research Laboratory, and expertise in bio-sensor engineering and electrophysiological measurement is being provided by Nicole McFarlane, PhD, UT Department of Electrical Engineering and Computer Science. Theoretical guidance is provided by Matt Mihelic, MD, Department of Family Medicine, bio-inspired computer scientist Bruce MacLennan, PhD, UT Department of Electrical Engineering and Computer Science, and theoretical chemist Travis Humble, PhD, UT/ORNL Bredesen Center for Interdisciplinary Research, who also holds a joint appointment with the Quantum Computing Institute at Oak Ridge National Laboratory. Grant Coordination is provided by Rebecca Higdon, MPH of the Department of Family Medicine, and technical and theoretical assistance is provided by Keith Britt, MS who is a PhD candidate working with quantum circuits and quantum logic under Dr. Humble within the UT/ORNL Bredesen Center for Interdisciplinary Research. The research group plans to establish a working experimental platform followed by research involving experimental manipulations of that platform to further explore the nature of biological quantum logic and its relation to central nervous system function. 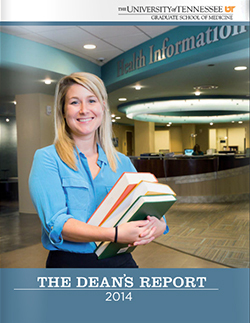 The 2014 Dean's Report, now available online, features stories of collaborations, breakthroughs in research, and change. 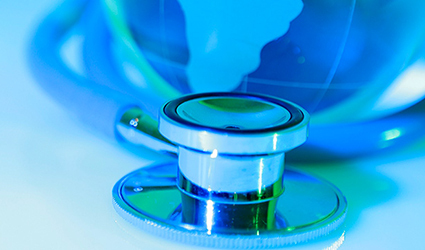 UT Graduate School of Medicine physicians and researchers collaborate with peers across UT institutions, throughout healthcare businesses, and with medical institutions across the nation to find new answers for diseases such as amyloidosis and cancer. Through these collaborations, there have been several breakthroughs in medicine leading to U.S. patents and a significant grant from the National Institutes of Health. Also, in collaboration with our partner The University of Tennessee Medical Center, a new Health Information Center opened in the main entrance area of the hospital and also encompasses Preston Medical Library. Read these stories and more in the 2014 Dean's Report. The Dean's Report is published by James Neutens, PhD, Dean of the UT Graduate School of Medicine. To request a print copy of the report, contact GSMNews. Leaders of the Pat Summitt Foundation and The University of Tennessee Medical Center held a media event Wednesday to announce a new strategic partnership to significantly expand the scope and capacity of the Medical Center’s existing Alzheimer’s Clinic and establish the Pat Summitt Alzheimer’s Clinic. 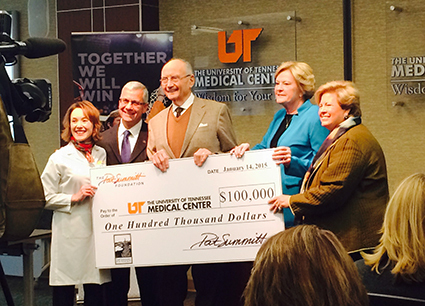 The joint announcement was made by the Foundation’s Advisory Board Chairman James A. Haslam II and The University of Tennessee Medical Center President and CEO Joseph R. Landsman, Jr.
At the event, the Foundation presented the initial grant of $100,000 to support The University of Tennessee Medical Center in the launch of this milestone initiative as part of their commitment to raise $500,000 per year over the next five years - $2.5 million - to support the Clinic’s operation and services. As a kick-off to the national fundraising campaign it was reported that an anonymous donor has stepped forward with a challenge pledge to match the first $1,000,000 in donations to the Foundation for this initiative. A key step in the launch of the Pat Summitt Alzheimer’s Clinic, according to foundation and medical center representatives, is to recruit and retain a full-time medical director with national recognition for work in both treating and researching Alzheimer’s disease. The medical director will lead the development of the Clinic including recruitment of other clinicians and researchers to advance its scope and impact. The American Alzheimer’s Association’s 2014 Alzheimer’s Disease Facts and Figures report that more than 120,000 senior citizens in Tennessee faced Alzheimer’s disease in 2010, a 20% increase from a decade prior. By the year 2025, more than 160,000 Tennesseans are expected to have Alzheimer’s disease. Pat and the Foundation’s leadership are committed to aggressively raise funds to fulfill her vision and support this milestone initiative. Pat is inviting individuals, corporations, and foundations to help with this battle by joining her team and making a contribution to The Pat Summitt Foundation. For more information visit www.patsummitt.org to learn about the many ways anyone can give or get involved. The Third Annual Medicine Conference: Practice Updates and Skills Development for the Primary Care Physician will be held April 17-18 at the Holiday Inn Downtown Knoxville. Registration is now open. Faced with an aging population, new developments in technology and treatment options, it will be increasingly important for the health care provider to stay up-to-date on the latest trends in the medical community. The Third Annual Medicine Conference will address new developments and trends in relevant areas such as heart failure, chronic pain, EKG interpretation, skin conditions and proper joint injection among others. This course is designed for physicians, physician assistants, nurse practitioners, nurses and pharmacists treating primary care patients. AMA, AAFP and ACPE credits are available. Learn more and register. Third Annual Medicine Conference: Practice Updates and Skills Development for the Primary Care Physician is presented by the University of Tennessee Graduate School of Medicine Department of Medicine. Registration is open for the John E. Sullivan D.D.S. Endowed Lecture: Diagnosis and Management of Trigeminal Nerve Injuries, April 22, at The University of Tennessee Medical Center. Competent patient care of peripheral trigeminal nerve injury in oral surgery and dentistry has been identified as a need for continuing dental education in this region. Expert in the field Shahrokh C. Bagheri, D.M.D., M.D., F.A.C.S., F.I.C.D., will present. Dr. Bagheri practices at Georgia Oral and Facial Reconstructive Surgery and holds appointments with Northside Hospital, Georgia Health Sciences University and Emory University. 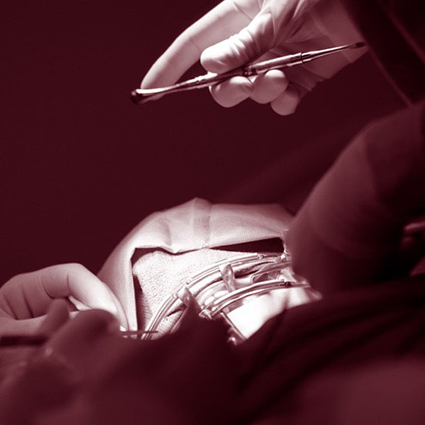 This course is designed for oral surgeons and dentists. Dental assistants and other healthcare professionals are also welcome to attend. Learn more and register. The John E. Sullivan, D.D.S. 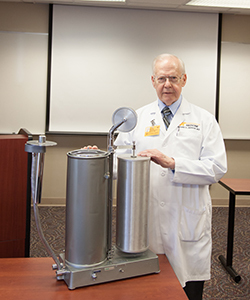 Memorial Endowment was established at the University of Tennessee Graduate School of Medicine by friends, colleagues, students and others to recognize Dr. Sullivan's contributions and his many years of dedicated patient care and devotion to teaching. Earnings from the endowment support visiting lecturers for the biennial Sullivan Lecture. The NeuroNET Spring Symposium, featuring, "Pain and Opiates: Neuronal Mechanisms, Behavioral Consequences, and Societal Impact," will be held April 8-9 in the Toyota Auditorium at the Baker Center on the University of Tennessee, Knoxville, campus. The NIH notes on its website, "Chronic pain is a major public health problem, which is estimated to affect more than 100 million people in the United States and about 20-30 percent of the population worldwide. The fact that one third of Americans have lives that are altered by chronic pain helps explain why the economic impact of chronic pain is estimated to be as high as $630 billion per year." Center for Disease Control statistics on its website illustrate the profound societal impact of the increase in opiate prescriptions. In 2012, health care providers wrote 295 million prescriptions for painkillers, "enough for every American adult to have a bottle of pills. Each day 46 people die from an overdose of prescription painkillers in the U.S., and 10 of the highest prescribing states for painkillers are in the South." Tennessee ranked second highest after Alabama among that group of 10 states. Featured speakers include James Eisenach, MD, Wake Forest School of Medicine; Tim Brennan, MD, PhD, University of Iowa Carver College of Medicine; Michael Smith, PhD, Johns Hopkins University School of Medicine; Kelly Conrad, PhD, Teva Pharmaceutical Industries, Ltd.; Ted Jones, PhD, CPE, Pain Consultants of East Tennessee; James Choo, MD, Pain Consultants of East Tennessee Functional Rehabilitation; Georgia Tourassi, PhD, Oak Ridge National Laboratory. The symposium is sponsored by a Haines Morris Endowment Award, NeuroNET, the Kavli Foundation, the UT Graduate School of Medicine Department of Anesthesiology, and the Brain and Spine Institute. 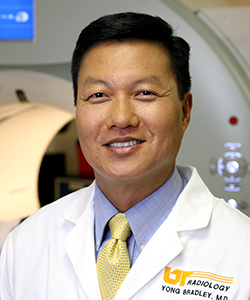 Collaborations between The University of Tennessee Medical Center and UT Graduate School of Medicine have resulted in record patient encounters for PET/CT imaging. Combined efforts of the Molecular Imaging and Translational Research Program and the Department of Radiology have resulted in PET/CT services for nearly 1,500 patients, a 20 percent increase over the previous year and more than 44 percent over the five-year low. Monthly records were broken 10 months out of the 2014 calendar year, with 133 patients being imaged in December. These increases in volume were supported while also adding more complex imaging services that provide high resolution motion corrected images for lung, pancreas, gastric, and liver imaging.